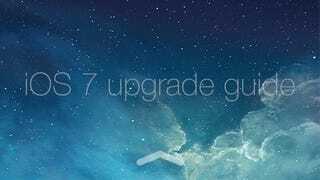 You can upgrade your iPhone and iPad now with iOS 7. You probably have a lot of questions about it—here are all the answers you need. If your device can support it, the answer is probably yes. Read Gizmodo's review to get a better idea about what to expect. It's Apple's most important and dramatic upgrade in a long time (see at the bottom), so be sure to take a very good look. Will my iPhone or iPad get all the new features? That depends on your iPhone or iPad model. This is a very good quick reference card that will give you all the answers. Some of the new stuff could be annoying, but here's how you can fix that. OK, I'm ready, how can I upgrade? If you are decided to upgrade, it is very easy. Just remember to back up first following this simple guide. Wait, where is everything now? If you are missing an iOS 6 feature, read this guide that shows how to find everything that has moved in iOS 7. As you explore, you will notice little changes that make everything a bit or lot better. Oh, do I need to get new versions of all my apps? If you want everything to look consistent with iOS 7's new flat design, you can upgrade your apps to new versions optimized for iOS 7. This is how many of them look now. If you want new flat look apps, some will require you to pay an upgrade fee. One new application that you need to download doesn't run in your iPhone or iPad: get iTunes 11. It's a must have if you're still synchronizing your music with a USB cable, but also to quickly purchase apps that will automatically be wirelessly downloaded to your phone or tablet. Yes, you may hate it. But most likely you will like the new functionality, and the new look will grow on you if you don't like it now. Oh, and one more thing: you can easily change Siri's—Apple's assistant—voice. The good news is that you don't have to upgrade to get iOS 7 features. You just need to jailbreak your iPhone or iPad, then get the features from third party developers. And remember, not everything is good in iOS 7 land, so don't be sad. Some of the people who upgraded are sad too. iTunes Radio Isn&apos;t For You. It&apos;s For Apple.